For other uses, see Cordon Bleu. A cordon bleu or schnitzel cordon bleu is a dish of meat wrapped around cheese (or with cheese filling), then breaded and pan-fried or deep-fried. (Veal) cordon bleu is made of veal pounded thin and wrapped around a slice of ham and a slice of cheese, breaded, and then pan fried or baked. For chicken cordon bleu chicken breast is used instead of veal. Ham cordon bleu is ham stuffed with mushrooms and cheese. The French term cordon bleu is translated as "blue ribbon". According to Larousse Gastronomique cordon bleu "was originally a wide blue ribbon worn by members of the highest order of knighthood, L'Ordre des chevaliers du Saint-Esprit, instituted by Henri III of France in 1578. By extension, the term has since been applied to food prepared to a very high standard and to outstanding cooks. The analogy no doubt arose from the similarity between the sash worn by the knights and the ribbons (generally blue) of a cook's apron." The origins of cordon bleu as a schnitzel filled with cheese are in Switzerland, probably about the 1940s, first mentioned in a cookbook from 1949. The earliest reference to "chicken cordon bleu" in The New York Times is dated to 1967, while similar veal recipes are found from at least 1955. There are many variations of the recipe, all of which involve a cutlet, cheese, and meat. 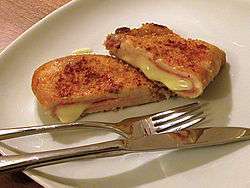 A popular way to prepare chicken cordon bleu is to butterfly cut a chicken breast, place a thin slice of ham inside, along with a thin slice of a soft, easily melted cheese such as Swiss. The chicken breast is then rolled into a roulade, coated in bread crumbs and then deep fried. Other variations exist with the chicken baked rather than fried. Other common variations include omitting the bread crumbs, wrapping the ham around the chicken, or using bacon in place of ham. A variant popular in the Asturias province of Spain is cachopo, a deep-fried cutlet of veal, beef or chicken wrapped around a filling of Serrano ham and cheese. In largely Muslim-populated countries, the halal versions of chicken cordon bleu are also popular, such that the chicken is rolled around beef or mutton instead of pork product. Look up cordon bleu in Wiktionary, the free dictionary. ↑ The Everything Almost Homemade Cookbook Linda Larsen – 2009 – Serve with a green salad and bread sticks. Ham Cordon Bleu Instead of chicken stuffed with ham and cheese, ham is stuffed with mushrooms and cheese in this twist on the classic. ↑ Larousse Gastronomique, completey updated and revised. New York: Clarkson Potter, 2001, p. 340. 1 2 "The Food Timeline"
↑ "Cachopo". Guia Repsol. Retrieved 25 July 2015.